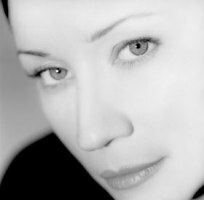 Canadian vocalist Holly Cole doesn't easily fall into any one category. Her smoky voice is sultry, yet she's ironically humorous and candid while reshaping traditional standards and pop classics. Jazz is her bedrock, but not exclusively. Born in Halifax, Nova Scotia in 1963, Cole was surrounded by music from an early age, and in 1981, she took up professional singing lessons. Her older brother, also a talented musician, introduced her to the intimacy and beauty of jazz singing by Sarah Vaughan, Anita O'Day, Billie Holiday, and Betty Carter. Cole moved to Toronto and formed her own trio with David Piltch and pianist Aaron Davis, who together developed a minimalist yet warm jazz style. The trio's debut album Girl Talk was released by Alert in 1990. Since then, she has released quite a few, original albums, blurring the borderline between jazz and pop. Since she cares about the audio quality of her output, most of her albums are audiophile favorites.